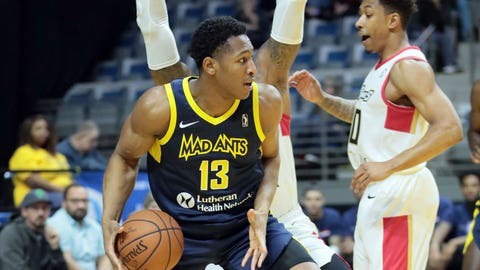 Second-year Indiana Pacers center Ike Anigbogu has been recalled from the Fort Wayne Mad Ants of the G League. Second-year Indiana Pacers center Ike Anigbogu has been involved in eight transactions since the beginning of the 2018-19 season, and the latest one finds him back in the NBA. The Pacers announced on Friday morning that they’ve recalled Anigbogu from the NBA G League’s Fort Wayne Mad Ants, with whom he has logged four tours of duty this season. Anigbogu, a second-round pick out of UCLA in last year’s draft, has played in one game for the Pacers this season, seeing three minutes of playing time and logging one rebound and one block. He’s played in four games for Fort Wayne, averaging 30.7 minutes and a double-double — 12.2 points and 10.0 rebounds per game. Anigbogu will be with the Pacers as they host the San Antonio Spurs in a Black Friday matchup at Bankers Life Fieldhouse.